3 nutritional consultations with Dr. Caplan. 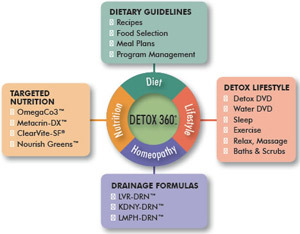 The cost of the Detox 360° Program is $750. To get started in the program, please email us using the form below. We will contact you to schedule your initial nutritional consultation and arrange for pick up or delivery of your program supplements. If you have additional questions about the Detox 360° program or would like to register, please contact Caplan Chiropractic today. *Image: Used with the express permission of Apex Energetics, Inc. without any sponsorship, approval, or affiliation with Michelle Caplan, DC.